Kevin Davies Ph.D. Executive Vice President, Strategic Development Mary Ann Liebert, Inc.
“A priest, a rabbi, and an elder walk onto a stage…” could be the unofficial tagline for an extraordinary medical conference. 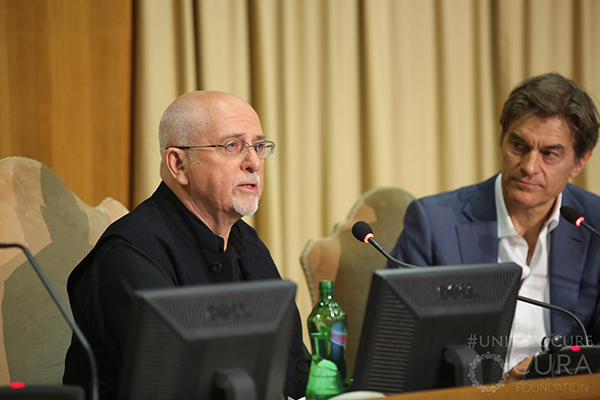 “Unite to Cure” was held last week at the Vatican. The invitation-only event is the brainchild of Dr. Robin Smith, president of the Cura Foundation, which co-hosts the biennial event with the Pontifical Council for Culture. 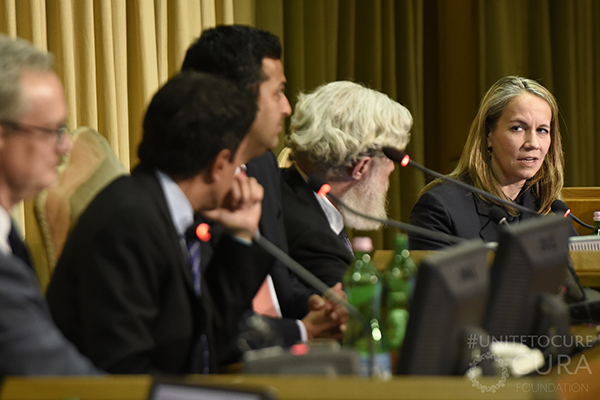 Over three packed days at the fourth international Vatican Conference, some 300 attendees were treated to a procession of talks and testimonials from researchers, physicians, entrepreneurs, and patients on advances in the prevention, repair, and curing of disease. The emphasis was on molecular and stem cell therapies, gene editing, as well as advances in prevention and healthcare investment. Moderators included TV personalities Sanjay Gupta (CNN), Dr. Mehmet Oz, Dr. Max Gomez and Meredith Viera. Presenters included sports and cultural celebrities Jack Nicklaus, Peter Gabriel, Tony Robbins and Katy Perry speaking on issues from stem cell therapy and digital communication to the power of meditation. 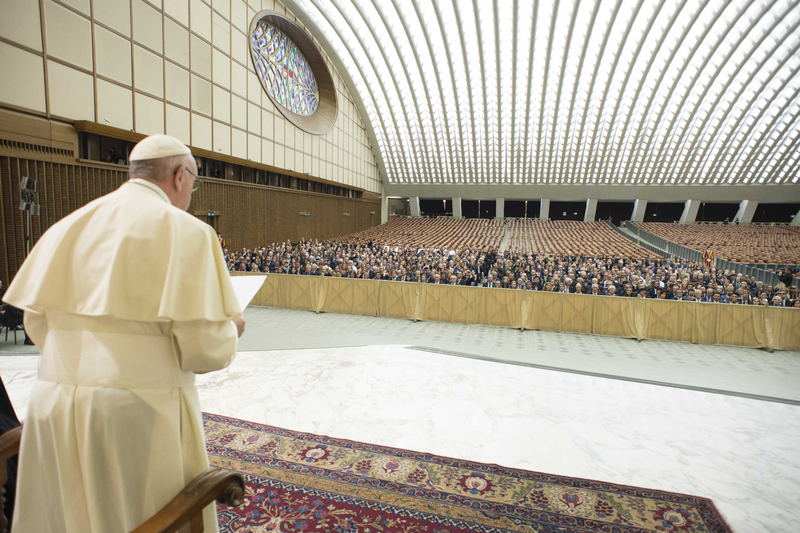 The meeting was highlighted by an audience with Pope Francis, in which he spoke of the need for prevention, protection of the environment, and caution in the application of gene editing. “We must also acknowledge with deep satisfaction the great strides made by scientific research in discovering and making available new cures, especially those related to the delicate problem of rare, autoimmune and neurodegenerative diseases,” the Pope said. This article highlights a few particular themes most relevant to the GEN audience selected from three packed days of presentations and discussion. The first evening featured a private concert by rock star Peter Gabriel, who dedicated his performance to the support provided by conference organizers and attendees in treating his wife Meah, following her diagnosis two years ago with non-Hodgkin’s lymphoma. Gabriel choked up in appreciation for his wife’s CAR-T therapy. Now he wants to give back. “Rich people will live forever and poor people will die in their billions. The trickle-down model isn’t going to change that,” he said. Noting that music streaming had transformed his own industry, Gabriel believes that something analogous could help the medical community improve access to healthcare. Viera, the former NBC Today Show host, also praised the conference for giving her husband new hope and medical options for treating multiple sclerosis. Gene therapy is “a pretty simple concept,” according to pioneer Dr. Jim Wilson (University of Pennsylvania Medical School), but “simplicity belies the execution. I’ve tried for 35 years.” He recalled the eureka moment in the 1980s when researchers hit upon the notion of using a virus to deliver normal genes to treat disease. Dr. Wilson’s lab has pioneered the use of adeno-associated virus (AAV), which has resulted in positive results in treating patients with hemophilia. Wilson also paid tribute to his Penn colleague Dr. Jean Bennett, whose results in treating Corey Haas (subject of The Forever Fix by Ricki Lewis) and other patients with a rare hereditary form of blindness “are nothing short of miraculous.” Before treatment–injecting an engineered AAV vector into the retina–video showed Haas struggling to navigate an obstacle course. Afterwards, he sailed around the course and can now play catch. Similar success is being seen elsewhere. At AveXis, CEO Sean Nolan is developing gene therapies for several neurological conditions, including spinal muscular atrophy (SMA), amyotrophic lateral sclerosis (ALS) and Rett syndrome. Children affected with SMA, often called “floppy babies”, cannot sit unassisted. The motor neurons die, leaving patients basically paralyzed, eventually dying of respiratory failure. “Think of it as ALS, but in infants,” Nolan said. Fifteen children took part in the initial Phase I trial, led by Dr. Jerry Mendell (Nationwide Children’s Hospital, Ohio) which was published in 2017. All are alive and event free, showing rapid increases in motor function attributed to elevated protein levels. Most of the children can now sit unassisted, which Nolan hailed as “unprecedented.” He showed a video of one child sporting a Spiderman backpack almost skipping out of hospital unassisted. At Sanford Research, Dr. Jill Weimer is hoping for similar results with gene therapies for Batten disease, a family of disorders caused by mutations in some 14 different genes. Working with one of the vectors developed by AveXis, Dr. Weimer’s group has swapped the SMN gene for the healthy gene (CLN6) that is mutated in some forms of Batten disease. Following promising results in animal models, which can have lifespan restored to wild-type controls, Dr. Weimer launched a clinical trial in March 2016. A report on the first dozen patients will be published soon, with applications pending for FDA approval for 2-3 additional forms of Batten disease. “We’re doing this faster, we’re doing it smarter, and we’re not cutting any corners,” Dr. Weimer said. Traditional gene replacement in the clinic is on the verge of being accompanied by gene editing using CRISPR (one gene editing trial using another form of gene editing was launched late last year). Not for the first time, the CEOs of the three publicly traded CRISPR biotech companies sat together for a wide-ranging discussion on the therapeutic potential and risks of CRISPR, moderated by CNN’s Sanjay Gupta. Dr. John Leonard (CEO, Intellia Therapeutics) noted the progress made in just 4-5 years since the CRISPR companies were founded. Although no CRISPR clinical trials are underway, Dr. Leonard said regulatory approval could happen as early as “the next few weeks or months, both ex vivo and probably in vivo.” Intellia’s first target – a liver disease called amyloidosis – is a “wonderful target”. Other candidates include tumors targeted ex vivo by manipulating lymphocytes. One of those degrees of difficulty is multiplex editing, but that doesn’t perturb Dr. Church. One of his companies, eGenesis, is making some 80 separate edits to the pig genome for xenotransplantation. “Those [pig] organs might be enhanced again to better replace a disease organ,” Dr. Church hinted. The conference was also sprinkled with celebrity endorsements, including several testimonials for experimental stem cell treatments. Jack Nicklaus was on hand to thank Dr. Eckhard Alt, a physician at the Isar Klinikum in Munich (affiliated with Sanford Health). Following stem cell treatment in 2016 to repair chronic back pain, Nicklaus reflected, “I can now hit a tennis ball and a golf ball without hurting — I’ve become a believer.” Two of his sons have had similar procedures performed. Given the choice between “get on an airplane to Munich or wait for the FDA to approve it,” Nicklaus said the answer was clear. Indeed, he was heading back to Munich for additional treatment on his back and shoulder. Another advocate is ex-Wall Street Ed Bosarge (Black Beret Life Sciences), who is driving experimental stem cell therapy for conditions including orthopedics and Parkinson’s disease. Bosarge has bought a stem cell clinic in Freeport, Bahamas, and wants to “turn back the clock on aging” using a dual approach: the idea is mannitol (a sugar) opens up the blood-brain barrier, which allows mesenchymal/adipose stem cells to tackle neuronal inflammation. Following positive results in humanized mice, Bosarge became the first patient to test this procedure (approved in the Bahamas) at the end of last year. He says he already feels improved memory recall. “My goal is to be healthy and fit and playing tennis at 120,” he said. A trial that has received FDA approval is the MIST trial, which uses stem cells to restore immune tolerance to treat autoimmune disorders including multiple sclerosis. Dr. Richard Burt (Northwestern University) just completed a phase III trial (without pharmaceutical support) and expects to publish the results, which he said show marked neurological improvement in patients, in a medical journal shortly. And while transplants are not cheap (more than $100,000), he said they should results in a savings to the patient (and their insurance provider). Dr. Pat Brown, the founder and CEO of Impossible Foods, said it wasn’t his goal to shame people into giving up meat–but his talk did that. After 26 years at Stanford, Brown asked himself some eight years ago: “What’s the most impactful thing I could do?” The resulting company aims to make a sustainable alternative to the use of animals to produce food. Dr. Brown said unashamedly this is “more important than a cure for cancer or extending the human lifespan”–two major themes of the conference. Quoting Pope Francis (“We have a duty of care to the planet and all of its creatures”) Dr. Brown said humans sacrifice billions of animals every day to satisfy our craving for meat. This has more climate-changing implications than all man-made pollution. And according to the World Wildlife Federation, half the wild animals on earth have been wiped out over the past 40 years. “We’re pushing animals to the edge of oblivion,” Dr. Brown said. Impossible Foods burgers are now available in hundreds of restaurants in major American cities. Dr. Brown told GEN that additional tweaks in the production process will produce meat alternatives that taste better than the real thing. One of the most enjoyable discussions was a panel on lifespan extension, featuring NIH director Dr. Francis Collins and a rabbi, a priest and an elder, which successfully juxtaposed science and faith-based views. In the Old Testament, noted Rabbi Edward Reichman, figures such as Methuselah lived to 900 or more, but after Abraham and Moses, the maximum lifespan was about 100. Dr. Collins could not confirm Richman’s suggestion that God had introduced a couple of genes to limit human lifespan, but did highlight major advances in the genetics of aging from basic research in yeast and roundworms. In roundworms, for example, manipulating a handful of genes can extend lifespan 4-5-fold. “Imagine applying that to humans!” Dr. Collins said. Some of those same genetic factors play roles in higher organisms such as mice, e.g. FOXO, with suggestions from genetic studies of centenarians that this includes humans. Although Dr. Collins believes “good health is more important than lifespan,” he said aging is not just running down but a programmed process. “The idea that we might be able to [play] around with that is appealing.” His own lab studies progeria, a rare genetic disorder of accelerated aging. Clinical trials in progress show some promising life-extending results. But X Prize founder and CEO Dr. Peter Diamandis brushed off such skepticism. “I want to walk on Mars, but I’ll take 30 years’ extension for now,” he said.